When people start working out, much of their success or failure in reaching their goals are based on their diet. 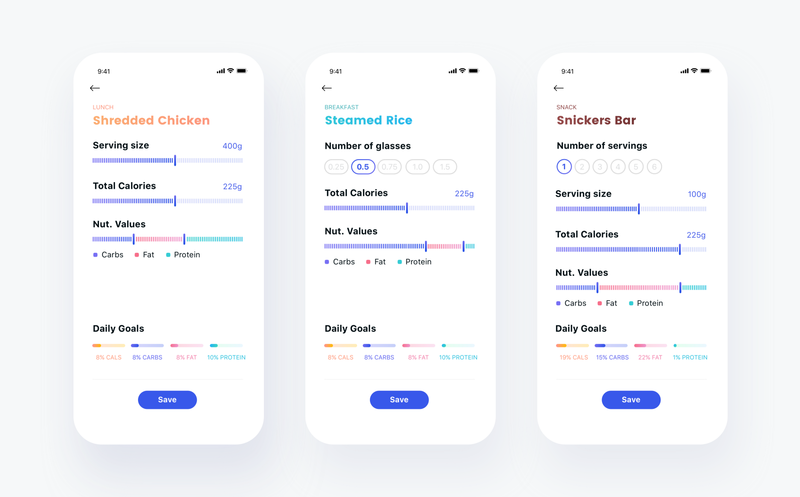 Even with a great plan, tracking your eating after every meal is very hard, and good UX can be an important factor in your success or failure in the long run. I found this as an interesting challenge to solve. While these are small numbers, it was more than enough for me and my personal project. Before diving in and bringing my own solutions, I downloaded the top nutrition apps in the Play Store and learned how they currently answer these problems. 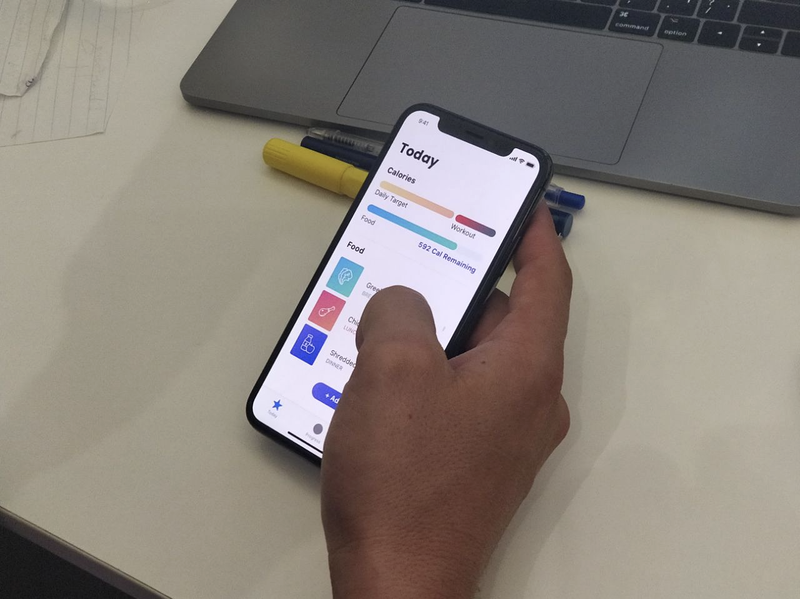 I found some nice time-saving features, and also one app which I thought was well designed and user-centered (Lifesum), but most apps weren’t intuitive, and they didn’t seem to me like they bring the best solutions for their users’ needs. In my solution, I focused on the two main pain points that the research showed, which are making the tracking as fast and easy as possible, and helping them remember to track their food. 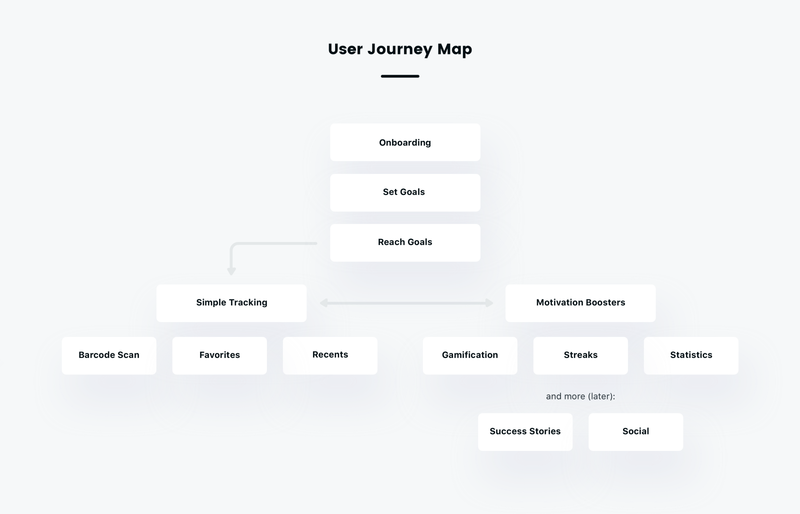 The main value of the onboarding process needs to serve, is to set initial expectations from the app, and to get the minimum information we need from the user in order to get started. I did this by showing a simple walkthrough and used forms that are as frictionless as possible with no need to type. 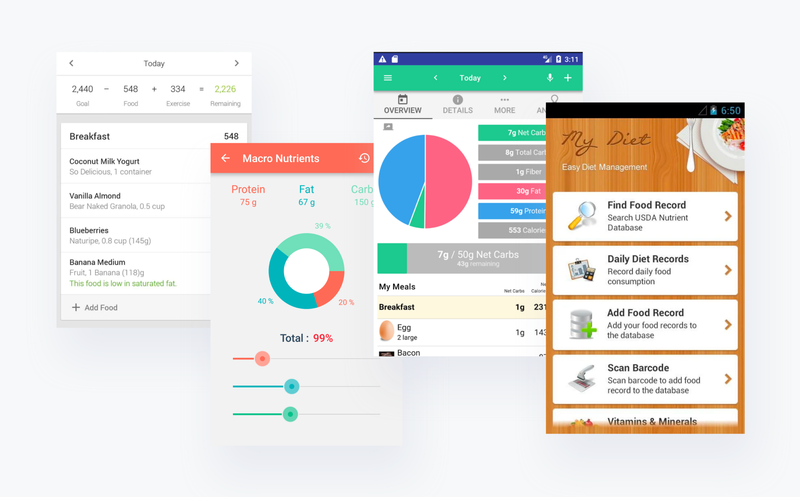 The main usage of the app should be the daily tracking of the food and drinks consumed. For the main tab, ‘Today’, I added the current standings of the calories needed to consume according to the user’s goals & calories burnt during the day. The form for adding food needs to have the least friction as possible, and give data regarding how this food effects the daily goals, I used sliders for that. When users will search for new food to add, they’ll be able to select their favorite food, and the recent food added at that time in the past day will be shown there as well. This might help them save time as well. Some food is measured in grams, some come in units, some in glasses. 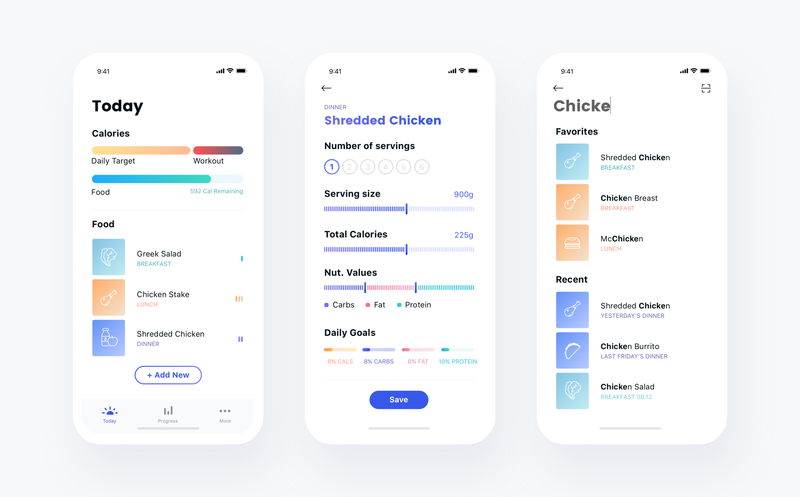 When food types are added to the database, they will include data that will make the form for adding it simple and relevant. 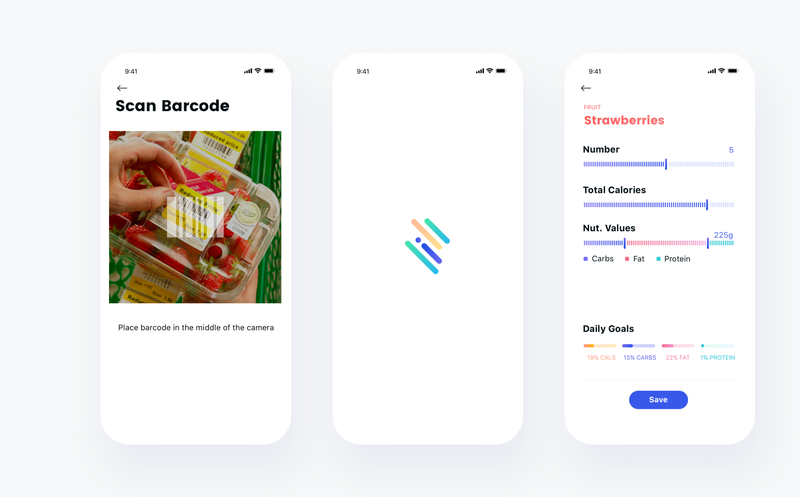 One great feature that some apps already implemented is the ability to scan a barcode and instantly add the product with the correct nutrition value. This is a necessary feature because it makes tracking for some meals easier. In order to encourage users to use the app for every meal, I thought gamification could be a good incentive. In the ‘Progress’ tab I added a points system, where users are rewarded for adding food and also for reaching their goals consistently. I also designed an ‘Achievements’ mechanic to encourage them to adopt healthy eating habits. In order to understand their current success, this tab will have interesting statistics regarding the past few days (or more). during the design process, I made sure to regularly get feedback from friends. 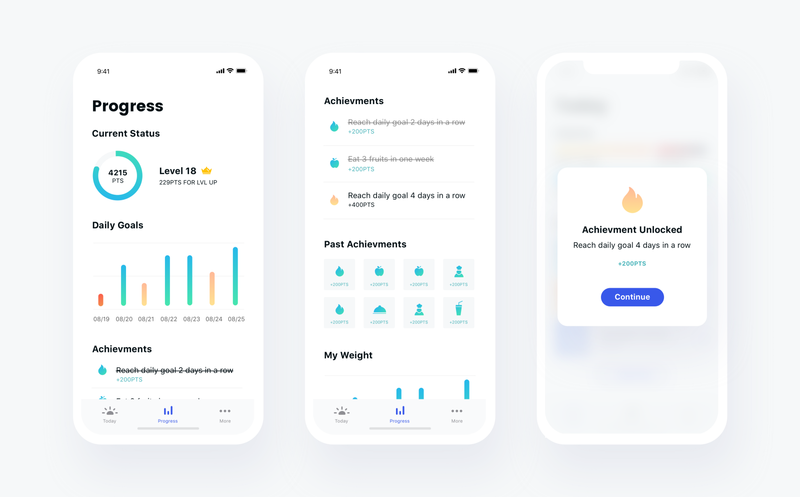 I made micro-prototypes in InVision and asked them to do simple tasks, such as “please add a 200g chicken breast you ate” or “check which achievements you still haven’t completed”. If they failed, I did changes and simplified my design until I got to a result that satisfies me. I believe this concept is a good place to start. 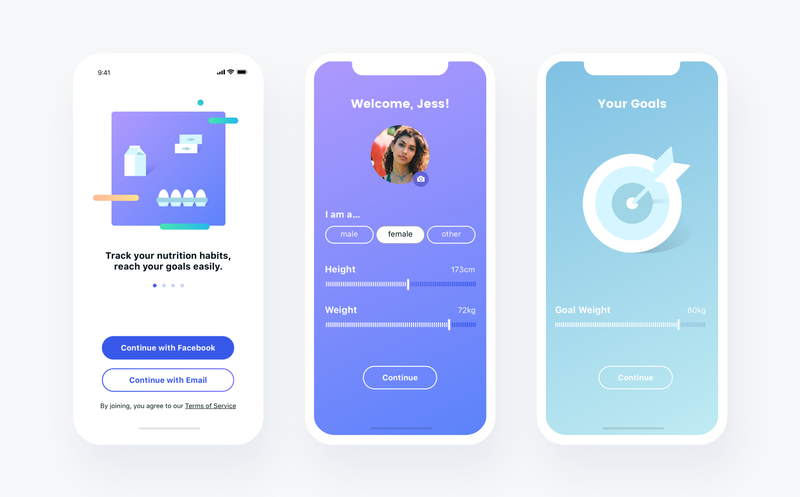 It implements good UX practices as a solution to a common problem, using the technology we have today, and it can dramatically improve the user retention for this kind of apps. What I love about designing such products is that by increasing user retention, i’m actually helping people live healthier lives, which is, IMO, a big deal.